Sleep is usually an afterthought in diabetes, taking a back seat to food, exercise, medication, and glucose monitoring. It took me a long time – and a lot of my own data – to realize that sleeping well is actually a mission-critical blood sugar strategy. What is remarkable about sleep is how pervasive it is: it impacts next-day blood sugars very directly AND indirectly. In fact, when diaTribe readers email me with blood sugar problems, I almost always ask them how much they are sleeping. This excerpt from Bright Spots & Landmines is from the beginning of the fourth and final chapter on sleep, and it highlights a topic that doesn’t receive nearly enough attention in the diabetes world: why a good night of rest contributes in major and minor ways to next-day blood sugars. Why Is Sleep in This Book? It has a strong connection to diabetes: studies repeatedly show too little sleep is associated with higher A1c and blood glucose levels; greater insulin resistance; more hunger, calories eaten, and carb cravings; weight gain; higher levels of depression; lower quality of life; and beyond. A slew of biological changes occur with too little sleep, including higher levels of cortisol (stress), increased inflammation, and changes in hunger hormones, which can all contribute to greater insulin resistance and higher blood glucose levels (citations below). Sleep is a highly underrated diabetes tool, especially because it is changeable almost immediately: I can almost always get more sleep tonight if I make it a priority. I see more blood glucose readings in my target range on the following day, especially after breakfast. I need less insulin the next day. I feel more energized for morning exercise. I’m in a better mood and less frustrated over small diabetes and life hassles. I make better diabetes decisions and I am more able to resist tempting foods. My body is less sore from exercise. But of all the Bright Spots in this book, I most consistently fall short on this one. I’ve most recently averaged just under seven hours of sleep during the week, not enough for me to be at my best. I’m a night owl and find it easy to stay up late, but I also love the idea of being a morning person. It’s a bad combination! I stick to a firm get-ready-for-bed time – at 10:30 pm, I make moves to shower, brush teeth, and get into pajamas. I decide to wake up later the following morning, accepting the consequences of not being able to exercise or do as much before the day starts. I try to do this no more than a few times per week. I reel in the “achiever” in me and realize I don’t have to finish whatever I’m working on tonight. I focus on what I will gain the next day by getting more sleep tonight: clearer thinking, happier state of mind, more productivity, more blood glucose readings in my target range, etc. Sleep is just as important as any other health behavior, and it is also just as difficult to change: modifying habits takes focused effort, and sometimes the tradeoffs are hard to swallow (e.g., earlier to bed means less time to spend with loved ones at night). This Bright Spot is definitely a constant work in progress for me. 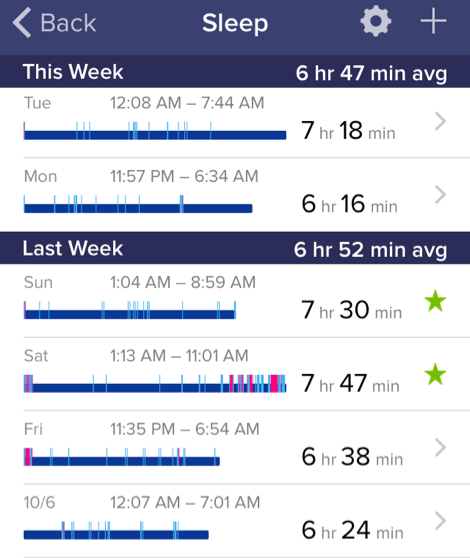 Track sleep with a device, app, or journal to get a sense of how much I’m getting. Most wrist-worn activity tracking devices can now measure sleep, though a growing number of apps and bedside devices can do it too. In the past I used an app called Sleep Cycle that ran on my phone and tracked movement while sitting on the bed – it wasn’t as accurate as a wrist-worn device, but it was much better than nothing. “Sleep tech” is now a hot industry and many new tracking devices are coming out that attach to the mattress or pillow or simply sit on the night stand – these are definitely worth exploring if you are not sleeping well. Have a firm get-ready-for-bed time (e.g., 10:30 pm) and set a phone alarm(s) that goes off at that time every night. It’s really easy to just shut the alarm off, so this must be paired with true commitment to get more sleep. 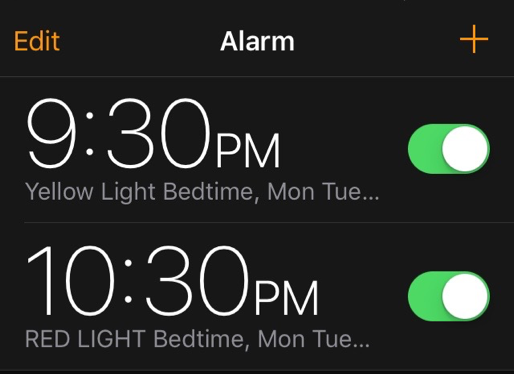 It’s actually helped me to set two alarms – a “yellow light” alarm at 9:30 pm (“Hey Adam, bedtime is coming soon”) and a “red light” alarm at 10:30 pm (“Get ready for bed – now!”). 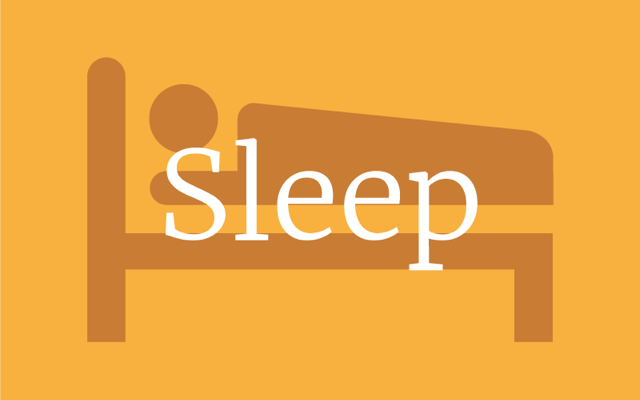 Ask a loved one to join me in a quest to sleep more. My girlfriend and I hold each other accountable! Priscilla always gently nudges me to get ready for bed, especially when I’m tinkering with an article or doing “one last email.” Her commitment to get more sleep definitely rubs off on me and gets me to bed earlier. Plus, I know I will treat her better if I’m well rested! Read some of the research on sleep deprivation – it’s terrifying to see how lack of sleep negatively impacts most things in life, and also good motivation to get to sleep earlier. If I want to be the best person I can be, I must sleep well. Get your copy of Bright Spots & Landmines here as a free/name-your-own-price download. You can also purchase it on Amazon in paperback ($6.29) and Kindle ($1.99). The print book is priced at cost to ensure widespread access, and 100% of proceeds from digital downloads benefit The diaTribe Foundation, a 501(c)(3) non-profit. Have you benefitted from Bright Spots & Landmines? I would love if you could take a few minutes to write a short Amazon review sharing your experience – even if it’s just one sentence!